The Year 9 curriculum provides a study of the history of the making of the modern world from 1750 to 1918. It was a period of industrialisation and rapid change in the ways people lived, worked and thought. It was an era of nationalism and imperialism, and the colonisation of Australia was part of the expansion of European power. The period culminated in World War I, 1914–1918, the ‘war to end all wars’. Students look at a variety of evidence to determine who ‘discovered’ Australia. In doing so they have to address the issue of what ‘discover’ means and what the implications of different definitions, or elements of an overall definition, are. Students are introduced to a range of ‘discoverers’, including Aboriginal people, Baijini gypsies, Chinese explorers, Macassan fishermen, Portuguese seamen, Dutch merchants, James Cook and Matthew Flinders. An interactive entitled, Build a timeline for the discovery of Australia, is also available for this case study. This decision-maker game will help students some of the experiences faced by hundreds of thousands of people during the Australian gold rush period in the second half of the nineteenth century (1850–1900). An interactive entitled, The Eureka Rebellion – could you have stopped it from happening? is also available for this case study. What does the Springfield farm tell us about Australian colonial life? Springfield is a pastoral property which was established near Goulburn, New South Wales, in 1827. It still exists today. The contents of the historic home were donated to the National Museum of Australia, and many of these are on display now in the museum. A study of this property and its historic objects can help us learn about colonial life — especially about economic, social and environmental features. This a multimedia education resource to help middle secondary students explore an aspect of Australia’s early colonial history — the crossing of the Blue Mountains in 1813. 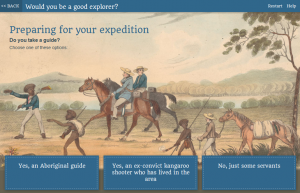 An interactive decision-maker entitled, Would you be a Good Explorer? is also available for this case study. What happened in a frontier conflict in Broome in 1864? An interactive entitled, Key moments — can you make key decisions in Australian history? is also available for this case study. Did WWI divide or unite local communities?